Diabetic eye disease is the leading cause of blindness among people ages 40 to 60. The longer you have diabetes, the greater your likelihood of developing vision problems increases. Keeping blood sugar, blood pressure and cholesterol levels under control can help people with diabetes maintain good eye health. They must also have a dilated eye exam once a year! Diabetic eye disease is preventable, and you can take steps to slow it down or even reverse it by taking care of your diabetes, your blood pressure and your cholesterol. A dilated exam allows eye doctors to check the inside of the eye for things like abnormal blood vessels, retinal swelling and nerve tissue damage. A dilated eye exam can help your doctor identify problems before vision loss occurs, which is important because often there are no warning signs and vision may not be affected when damage first develops, the rate of blindness among diabetic patients is 20 times higher than that of the general population. 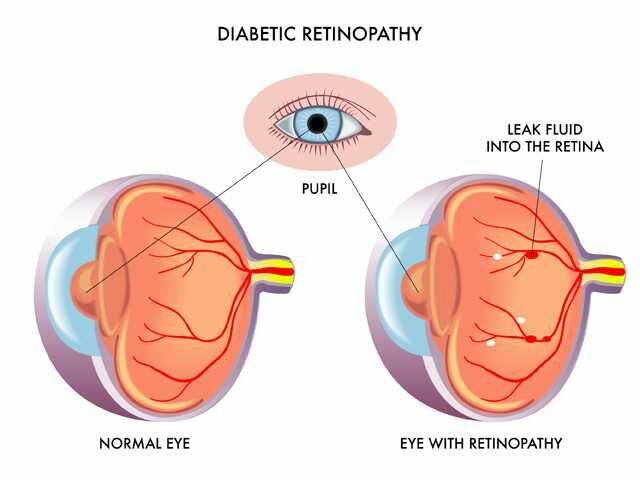 Eye problems that can affect people with diabetes include diabetic retinopathy, diabetic macular edema, glaucoma and cataracts. Strict control of blood sugar and blood pressure—through medication, a healthy diet and exercise—can help people with diabetes avoid serious vision problems. Ideally, they should strive to keep their A1C level, an indicator of how well you are managing your blood glucose level, below seven percent. People with diabetes should also avoid smoking, as it can contribute to vision problems and other serious health problems such as heart and kidney disease and peripheral neuropathy, which can cause weakness, numbness and pain in your hands and feet. Have you had your eye exam? Please contact Jessica to schedule to come in for this exam. This exam generally takes about 15 minutes.